Today I'm reviewing BK Super Matte Surface Oil top coat. This can be found on BornPrettyStore.com. This review may seem a little hyper since this is my first matte top coat and I had so much fun experimenting with it! Claim: I couldn't find an exact claim for this polish, however it says that you apply the matte transfiguration surface oil to your nail, and then your nail polish will change to matte. Packaging: I like packaging like this bottle has. It's in a round glass bottle which holds .5 fl oz. The bottle is "foggy" looking which I think fits well since it's a matte top coat and the packaging is "matte" as well. The top goes on securely and everything feels durable. I was concerned about the top because it looked like it wasn't twisting down all of the way, but I realized that must just the packaging. I haven't experienced any leakage of any sort, so everything there is fine. Texture: I'm glad this top coat has a thinner consistency, I hate dealing with thick and goopy top coats. I was kind of skeptical about the "surface oil" in the name, thinking it would be oily and run all over my nail. However, I was proven wrong. It applies really nicely and has a fairly quick drying time. It only takes a small layer for an amazing matte effect. The drying time is not as quick as my OTD top coat, which I didn't expect it to be, but it dries just as fast, if not faster, as Sally Hansen Mega Shine. I recommend waiting until your polish and/or design is completely dry before applying this, or any top coat for that matter. Scent: It's nothing overwhelming. Basically, it's nail polish. Longevity: I did a manicure with this which I wore for a little over three days. I didn't have any chipping or peeling, which made me quite happy! I didn't really test it for longer than that because that's my typical wear time with nail polish, I experiment a lot. Here is a nail design I did using this top coat. I applied China Glaze Liquid Leather and then the top coat. Then, using tape, I created glossy tips with Liquid Leather. In the image above, to the left is China Glaze Snow alone. 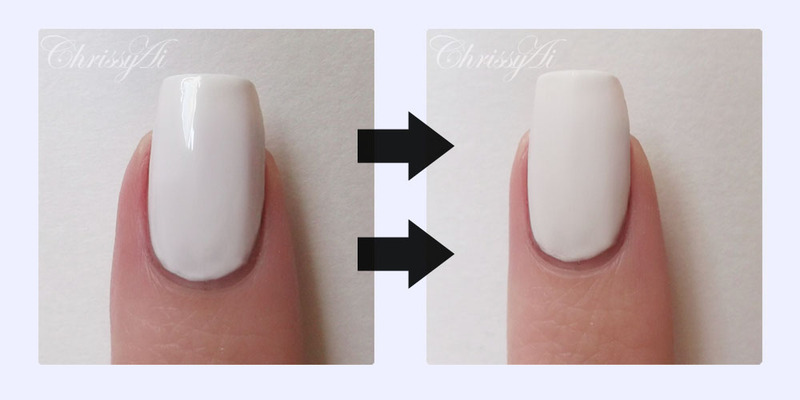 The picture on the right is Snow with the BK Super Matte Surface Oil Top Coat. These were the results gotten in approximately 20 seconds. Also, instead of just a solid color, I also wanted to demonstrate the effect on a metallic and glitter. The images were a little hard to get, but I did my best. Here is Sally Hansen Celeb City and China Glaze I'm Not Lion, both alone. Here they are with the matte top coat. I was pretty surprised by how Celeb City turned out and I have a nail design in mind for it after seeing the result. Thoughts: I'm quite happy with this top coat and the results I get from it. It is my first matte top coat so I couldn't compare it to any others, however I'm glad I can add it to my collection now. The effect doesn't take long at all to set in and the drying time is pretty great for a polish that doesn't claim to be fast drying. You can purchase this top coat here. 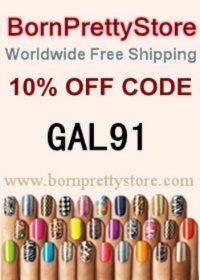 can use to receive 10% off their order. The code is "GAL91" as seen in the image. is my own honest and uninfluenced opinion based on my own personal experience. I'm not into nails that much, basically because mine are quite ugly, but i have to say the design you did in black looks amazing!and i also like the effect on top of a metalic color. looks like a nice product and this was a very complete review! Thank you so much! I was never really into nails much either until I saw so many designs from different bloggers. I really love this look! Like Beatriz I'm not much into nails either and I don't plan on having a huge polish collection but I feel like I really want this matte topcoat now after seeing the results. Awesome, thanks for letting me know, I'll check it out! It look so fantastic! That black nails are so amazing, I loved it! Thank you! They were really easy too! Hehe, glad I could help! Thanks! I'm not very knowledgeable about nail design but that black manicure you created looks amazing! The top coat gives a really interesting contrast. Thanks for sharing! Thank you! I really like it. (: Thanks for reading! It's funny, I have a matte top coat from last year that I haven't used yet, but I've always loved the look! Ooh, I don't think I know who you're referring to. She's a veteran of the nail art world and she is most well-known for matte black nails with shiny French tips. I wish I could get into your imagination when it comes to nail art! I LOVE the black nail polish! Btw, i am now following you. I discovered you at Mondayblues. Hope you follow back! this is a great looking topcoat, but it sure helps when YOU are the one applying it! haha. love that black glossy and matte manicure, so chiq.